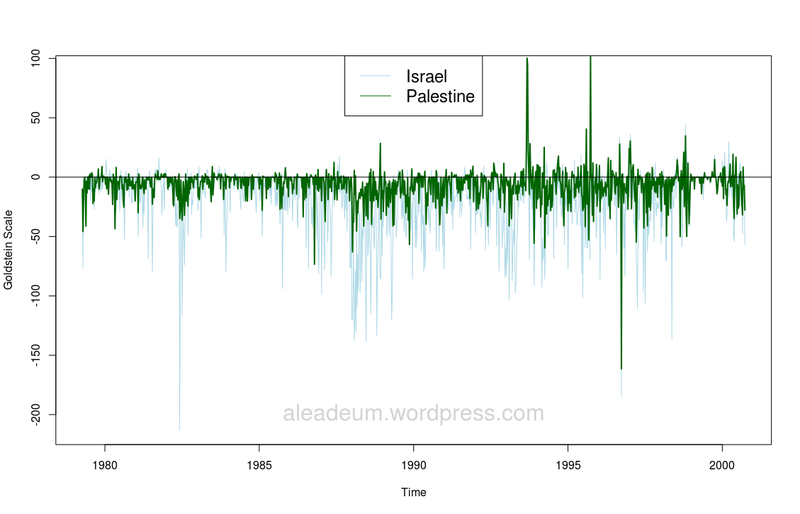 HomeIsrael vs Palestine: Who is to blame according to statistics? Data seems to suggest that, though Palestinians are the ones more actively looking for troubles they are also the ones more actively looking for solutions, whereas Israelis seem to adopt a more nonchalant attitude either way. Israel does something “minor” allegedly in response to something Palestinians did in the first place. Palestinians say that the Israel attack was unprovoked and fires up rocket parties in their backyards. Israel holds the right to defend itself, crunches the rocket parties and, with them, the children around. Once the Palestinian side have enough pictures of dead children for their international PR campaign, and Israelis enough rocket parties crunched to show their citizens they mean business, then both sides stop the war and declare victory over the other side. Media take sides on who was the instigator and therefore on who is to blame. A few months afterwards go to step 1. After the latest of a series of endless conflicts between Israel and Palestine I wondered if I could do some statistics to figure out how much truth and how much bias media have when they drop blame on one side or the other. It is obvious that the Israeli side causes more damage to the Palestinian side given its military supremacy, nobody question this, but I wanted to know if there is data showing which side instigates the other since, according to whom you read, the instigator is always the other side. To validate the initial conclusion let’s consider positive, negative and neutral periods as those coming right after a non-positive, non-negative and non-neutral period and, by counting those, we might have an idea of who engages into instigating the other side more often. Next we can see a graphic summary of such periods since 1979 to 2003. Data shows that Palestinians have historically engaged in negative initiatives at a higher rate than Israel, to be precise, since 1979 up to the year 2003 the Palestinians have engaged in negative initiatives (that is, initiating hostilities after a period of non hostility) a total of 236 times whereas Israel have done so 159 times. That is a 59.7% for the Palestinians and a 40.3% for the Israelis. One might think that Palestinians are the ones looking for troubles if it wasn’t because when we consider positive initiatives, that is, those taking place after a non positive period, we see the reverse side of the coin. Now Palestinians have a total of 160 positive initiatives in the same period whereas Israel has done so 122 times. That is a 56.7% for the Palestinians and a 43.3% for the Israelis. We can also see that, though Palestinians engage in negative initiatives more often, they also do so for shorter periods of times than Israelis whose initiatives, interestingly and probably for strategic reasons, show a peak in the 6 weeks length period. On the other hand, for positive initiatives both side show the same preference in their length though, in this case, the most likely reason is because the positive initiatives consist mainly in negotiations and once they are over, they are over for both sides. There are obviously many different ways to interpret the data based on ground knowledge of what is actually going on in the conflict; while some may see in the data proofs that Palestinians are the instigators other may say that data shows clear evidence that Israelis are trying to stall any peaceful process. Nonetheless, I think it is a good idea to consider the rates of positive and negative initiatives in order to have a better understanding of the issue. [It] uses automated coding of English-language news reports to generate political event data focusing on the Middle East, Balkans, and West Africa. These data are used in statistical early warning models to predict political change. 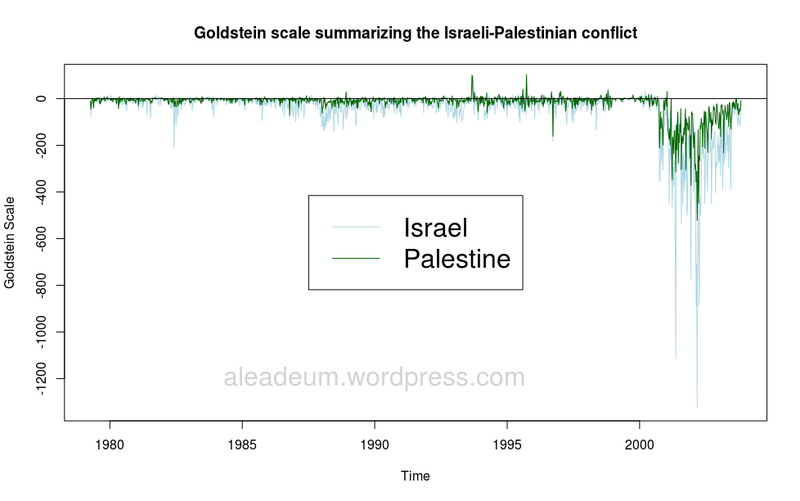 This data set gives Goldstein scaled totals that summarize the Israeli-Palestinian conflict from April 1979 – December 2003. These are dyadic or directed actions from one party towards the other. Data are weekly starting April 15, 1979. Positive values indicate cooperation, negative values indicate aggression. These are a subset of the Levant dataset from the Kansas / Penn State Event Data System Levant dataset. The data are from Reuters and AFP news sources and encoded into the World Event Interaction Survey (WEIS) coding system and Goldstein scalings using the Penn State Event Data System TABARI program. We cannot trust media but, can we then trust data? of course not! But at least raw data does not carry the huge bias that media introduces when they interpret it… only our own bias when we interpret it, which often is just as bad if not worse but, nonetheless, sometimes a different bias makes a study worth the time.